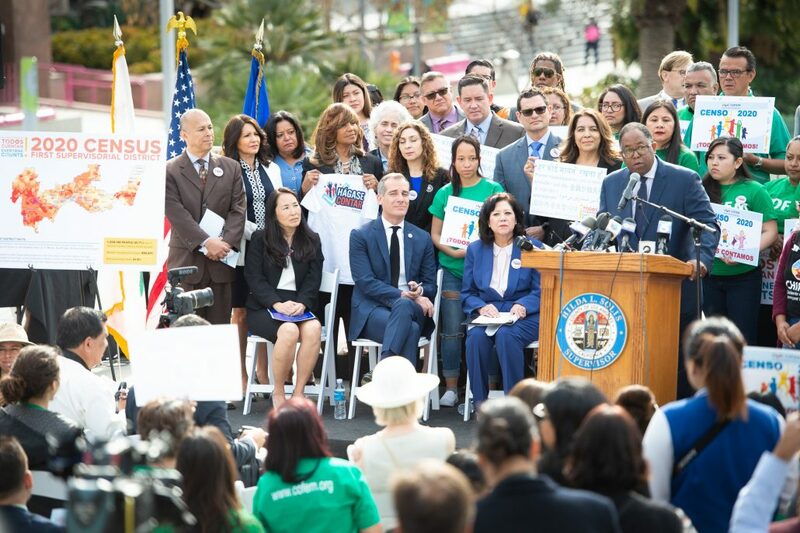 Los Angeles County, City, and community leaders joined together for a “Census Call to Action” rally in downtown’s Grand Park to the County’s unprecedented partnership and to raise awareness exactly one year ahead of the 2020 census in an effort to ensure that hard-to-reach populations are counted. Los Angeles County is considered the hardest-to-count county in the nation with over 10 million residents. A Census undercount could translate to fewer federal funds for transportation infrastructure projects, economic development, and programs that help support our most vulnerable residents. The 2020 census will launch April 1, 2020. The census can shape many different local community benefits such as hospitals, fire departments, schools, and highways. Each year, the results help determine how more than $675 billion in federal funding is distributed to states and communities. The census is mandated by the United States Constitution. The U.S. has counted its population every 10 years since 1790.